Consistent at the trials with two thirds and a second, Harlow was eased back to last from the outside gate by rider Matt Cameron and still trailed the field nearing the 1 f, before kicking into overdrive and winning going away with her ears pricked. “She’s got a bit of presence about her, the white-flecky mane and tail makes her stand out,” Richards said. “We really like her. She trialled well and it was always going to be tricky from back in the field, but she showed her class and Matt gave her a lovely ride. “She’s got a beautiful frame and has a fair bit of maturing to do yet, so we’re excited about her future,” Richards said. 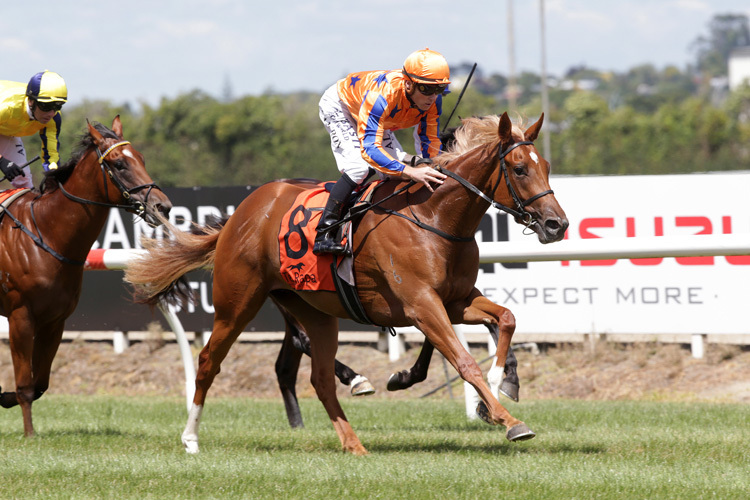 Harlow is the second winner for Rich Hill Stud’s young stallion Proisir, who was represented by Tauranga winner Tappy's One last month.